Danish police have arrested six people who had earlier scaled the walls of the Iranian Embassy in Copenhagen, in an attack that elicited a strong protest from Tehran. The arrests were made on Thursday after the six, described as four Iranian expatriates seeking asylum in Sweden and two others holding Swedish residency, violated the Iranian diplomatic premises in the Danish capital. The incident saw the invaders entering the mission’s courtyard earlier in the day, putting up profane placards and forcing down the Iranian national flag from the flagstaff. 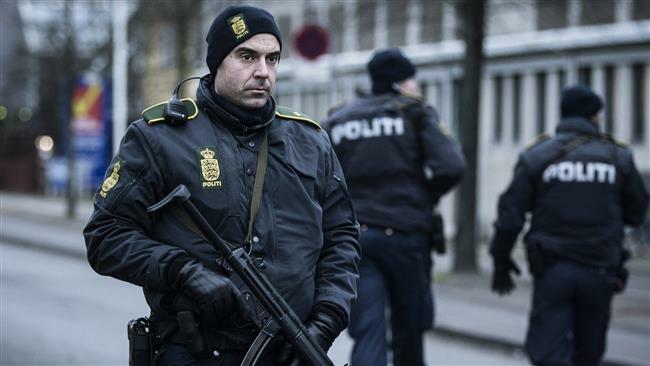 Copenhagen police superintendent Henrik Stormer said the detainees were being held in police custody. Following the incident, Danish Ambassador to Tehran Danny Annan was summoned to the Iranian Foreign Ministry, being notified of the Islamic Republic’s protest over the attack. Ministry spokesman Bahram Qassemi said Tehran had roundly criticized the attack by the “anti-revolutionary elements,” calling it in contravention of international regulations and demanding that the Danish government expeditiously address the affair. This is not the first time Iran’s diplomatic premises are violated abroad. Members of the anti-Iran terrorist Mujahedin-e Khalq Organization (MKO) have on many occasions trespassed on Iranian missions abroad. Out of the nearly 17,000 Iranians killed in terrorist assaults since the victory of Iran’s 1979 Islamic Revolution, about 12,000 have fallen victim to the MKO’s acts of terror.